ML is not only a hot buzz word but is becoming an expected component of modern businesses. Companies that want to stay competitive invest in ML infrastructure that supports the data prep, training, serving, and management of ML algorithms. Overarching ML workflow themes include accelerating time to value and production optimization. We delineate sub-category trends below. As with any new market, heightened interest results in a deluge of options for the operator. We categorize ~280 offerings from academic research to open source projects to commercial offerings (both startup and established) to provide a comprehensive picture of the ML workflow landscape. Data prep: According to CrowdFlower, data scientists spend ~82% of their time dealing with data. Cleaning and organizing data represents the largest chunk at 60% and suggests improvements in this area could have a significant impact. It is not only important to have clean data, but ML algorithms need a lot of it. We see the rise of synthetic data and third-party data sharing platforms to help expand companies’ training data. The chief executive officer (CEO) is the highest-ranked executive in a company. The CEO has many responsibilities, ranging from setting strategy and direction to configuring the company’s culture, values and behavior. The chief executive is also responsible for building an executive leadership team and allocating funds to match the company’s goals and priorities. Some CEOs have even more on their plate, especially those at the head of startups. Oftentimes they are responsible for more than just the traditional duties, and can include anything from brewing coffee to marketing their product. Solutions Review has compiled this list of the 10 coolest business intelligence and data analytics CEOs based on a number of factors, including the company’s market share, growth trajectory and the impact each individual has had on its presence in what is becoming the most competitive global software market. Some of the top data and analytics CEOs have been with their respective companies since day one while others are serial entrepreneurs. One thing that stands out is the diversity of skills that these chief executives bring to the table, each with a unique perspective that allows their company to thrive. ... Bob Selfridge is the founder and CEO at TMMData. Since its founding in 2008, he has led the company with his goal of developing and delivering software that provides users across an organization with easy access to data from a variety of sources. In addition to leading the company as CEO, Bob also serves as the company’s chief technical officer, leading the vision for product strategy, design, and engineering. Bob is a software development veteran with over 20 years of experience building software, engineering and managing IT systems, maintaining data security, and integrating information infrastructures across organizations. The "Data Wrangling Market by Business Function (Marketing and Sales, Finance, Operations, HR, and Legal), Component (Tools and Services), Deployment Model, Organization Size, Industry Vertical, and Region - Global Forecast to 2023" report has been added to ResearchAndMarkets.com's offering. The growth factors include the increasing volume and velocity of data and advancements in AI and ML technologies. However, companies' reluctance to shift from traditional ETL tools to advanced automated tools is a restraining factor in the data wrangling market. 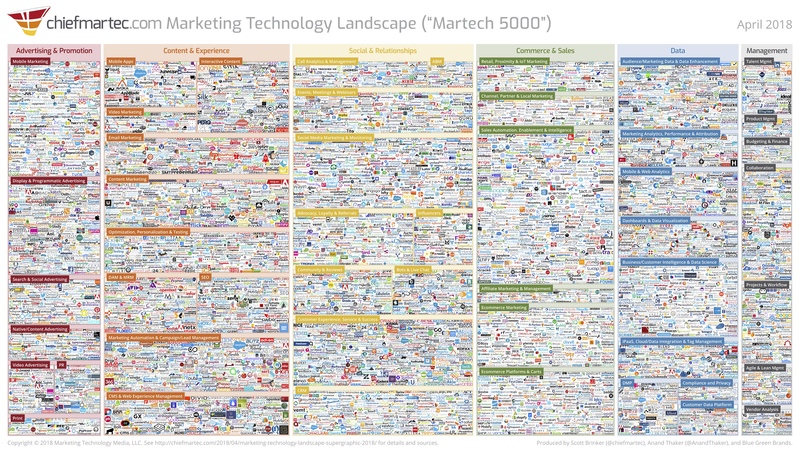 I’ve kept the nickname of the Martech 5000 — it has a certain ring to it — but this year’s graphic actually charts 6,829 marketing technology solutions from 6,242 unique marketing technology vendors. The thriving category of iPaaS (integration-platform-as-a-service) solutions on the martech landscape is a testament to the immense demand for orchestrating all of these different components, making the whole greater than the sum of its parts. ... TMMData announced its integration with Adobe Cloud Platform, developed in collaboration with Adobe’s platform product team. Adobe selected TMMData, a premier flexible data integration and preparation platform, to integrate with its Adobe Cloud Platform due to its deep expertise in developing data integration solutions for the past ten years. The integration with Adobe Cloud Platform provides bi-directional Extract, Transform and Load (ETL) integration services, providing marketers with the ability to seamlessly move data between Adobe Cloud Platform, on- and offline sources, and cloud or on-premises databases. “TMMData has a strong track record of helping brands with a smooth data connection.They were an obvious partner to collaborate with early on this initiative. We’re excited to have TMMData involved in Adobe Cloud Platform and look forward to continuing our work with them in 2018,” said Jim Rivera, Senior Director Product Management, Adobe Experience Cloud.